Battery backup system is ideal for supporting a variety of computer, internetworking, telecom and consumer electronics equipment. USB port enables unattended shutdown without data loss during extended power failures. Automatic Voltage Regulation circuits correct brownouts without using battery power. Battery-supported outlets are for use with computer, monitor and one vital system peripheral the additional surge suppression-only outlets are designed for printers and other system accessories not requiring battery backup. Dataline suppression jacks protect modem, fax machine, cordless phone or other peripheral with a standard dialup or DSL phone connection. 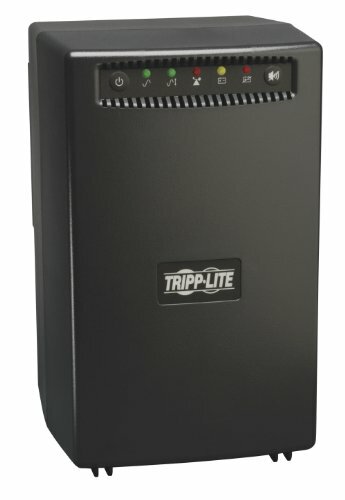 Audible alarm and front panel LEDs indicate UPS system and line power status. Protection Type: DSL Ethernet Fax Modem Phone Power System VA: 1500 VA Backup Time at Half Load: 8.5 minutes 470 Watts Lines: 1. AVR CORRECTS BROWNOUTS & OVERVOLTAGES WITHOUT USING BATTERY POWER: Otherwise known as Automatic Voltage Regulation, this conserves battery power for critical blackouts. Also features TEL/DSL/Ethernet protection.